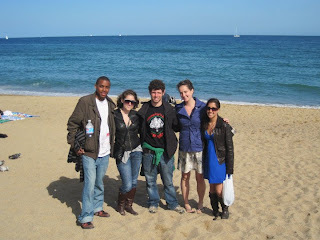 My Easter weekend was spent exploring Barcelona and it was the relaxing vacation that all of us needed. We were pretty lucky with weather in Ireland at the start of the trip, but lately it has just been rain, rain, rain. What a perfect time to head to a beach and 60 degree weather! Colleen, Melissa, Trevor, Jack and I got in after midnight on Thursday night and were exhausted. Luckily, there was a really good restaurant right down the street from our hostel, where we had sangria (the first of many pitchers throughout the weekend) and some yummy chicken. This was a good Friday. Pun intended. We started out by heading to Camp Nou, the stadium where FC Barcelona plays its matches. We got some churros on the way and waited in line to get tickets for Saturday night's match against Athletic Bilbao. We were able to get seats in the nosebleed section for just €52! Then we headed into the Barcelona city center for some sightseeing. Did I mention the weather was gorgeous? Then we made our way up a pretty decent sized hill (mountain?) to get to Park Montjuic, where we realized you could get a great view of the city. Plus, there was a gondola ride from there to the beach. Of course we took it, we travel in style. The beach! We were so excited. We got cozy on the sand, just staring at the Mediterranean Sea and trying to avoid the various people soliciting their services. Massage? Scarf? Tattoo? Beer? Smokes? However, we weren't able to completely keep them away, as one woman just started giving Jack and Colleen massages, which they were not exactly comfortable with, and a guy started selling scarves to Melissa. The beach was a little chilly with the breeze, so we walked around until we found a place to sit and eat. Zahara's became our favorite lunch spot of the trip. We went back on our last day, but this time, I got a chicken, mozzarella and vegetable sandwich. Then we strolled through several of the many booths and tents of the street markets. They were selling mostly jewelry and knick knacks, but I found something great. Ever since Venice, I've regretted not buying one of the fun Carnivale masks, but at the time it wasn't something that I would have been able to fit in my suitcase without breaking. So when I saw a vendor selling the same type of masks, except made of leather (meaning they can't break in half! ), I just had to buy one. Plus, I had an enormous amount of room in my backpack this time around. My packing skills have improved so much. I will probably never wear it, but it will be a fun decoration to have around. Then it was off to more sightseeing in the warm, glorious beyond glorious weather. Then we met up with Tori, who was on her break from classes and work, and strolled down La Rambla, a street full of vendors, performers, shops and sangria. The street performers were really hilarious. They really put their all into the preparation, costumes and show. And look what else they had! We were also able to see several Good Friday processions. Tori explained that during Easter weekend, statues are taken out of the churches and paraded around. We saw a couple different ones, but this statue of Jesus carrying the cross was my favorite. We said goodbye to Tori and headed over to the Magic Fountain, which plays music as it makes the water shoot into the sky. We had a blast dancing around to Forever Young and other songs that are meant to promote badly sung sing alongs. Colleen and I had been feeling under the weather all day, so when all of us went back to catnap before going out, the two of us decided it would be better to just sleep off whatever was wrong with us. So we slept a good 13 hours that night while Melissa, Trevor and Jack went off to explore the nightlife. We started off the day by walking to Park Güell. The sun was shining again and we had a relaxing day of strolling around, listening to music and looking at the Antoni Gaudí architechture. His work was my favorite part of Barcelona. Not only does he make everything look whimsical, but he does so with tile mosaics, which were so incredible to see. I can't even imagine how many tiles he smashed over his lifetime. Then we headed back into the city for some more Gaudí architecture. The Sagrada Familia is an unfinished church that Gaudí was working on before he died. They are working on finishing it with his aesthetic and original plans. He died in 1926 and it's still got a long way to go. But there was no denying that it was some place special. The front of the church depicts Jesus' death and the back is his birth. The inside of the church is inspired by trees and nature. We stopped to get dinner shortly after this visit. We all tried different kinds of paella. I got the paella mixta, which is rice, peppers, prawn, chicken, muscles, squid and pork. I pushed the pork to the side and dove into the rest. It was quite yummy. Then we headed out to the big soccer match. The girls all bought FC Barcelona scarves so we could blend in a little better with the fans. The game was amazing! Over 100,000 people were in attendance and it was just so exciting to see people that excited about soccer. I must say, it made me miss playing. And to make it extra sweet, FC Barcelona beat the Athletic Club 4-1. After the game, we went out for some tapas and more sangria, surprise surprise. The stuff flows like water there. Actually, it's cheaper than water most of the time. We decided that it was definitely ok to drink it with every meal because it has fruit in it, and we're all about being healthy. It was so strange not being home for Easter. We woke up in our bunk beds in the hostel and were all a little disappointed that we did not have any egg hunts to run to or candy to eat. Not being with our families just felt a bit off. Nevertheless, we got up and went to church at the Barcelona Cathedral, which was spoken in Spanish. After mass, we decided that this whole not having chocolate eggs on Easter thing was not going to work. We stopped at the nearest sweet shop and got some delicious treats. One of Colleen's coworkers had told her about Montserrat, which is a monastery in the mountains outside Barcelona. A hidden gem, she called it. And it certainly was. Ninety minutes, one train and one cable car later and we were atop a beautiful mountain with even more breathtaking views. The coolest part of being up that high was that we could see a thunderstorm slowly rolling into the valley. We saw lightning and dark clouds in the distance and watched as it delicately moved across the sky. Not wanting to get stuck on top of the mountain when it started to storm, we headed back into the city for some more sightseeing. We saw two more of Gaudí's works. After walking around a bit more, we decided it was time for our Easter feast. We had every intention of splurging on tapas and sangria. We found the trendy restaurant Divinus and did not hold back with ordering food. Magically, though, since we split the tapas and pitchers of sangria, it ended up being one of our cheaper meals. But it was by far the best. We just enjoyed each other's company and chit chatted for the rest of the night. Easter Monday is a holiday in Europe so we were able to extend our vacation into the week. We had seen all of the major attractions by this point so we spent our day simply relaxing. We checked out the Dalí museum first. He's the artist who paints the pictures of the melting clocks, though his most famous works are in New York, not Barcelona. His museum was great, though. He seemed like such a wonderfully crazy guy. I just love his mustache. Unfortunately, my camera battery decided to die on me right as we left the museum. I had taken a risk in not charging it midway through the trip, and I lost. The next two photos I stole from Colleen. 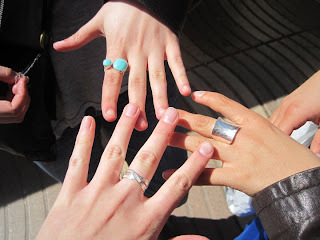 We left Dalí and headed down La Rambla one more time, where all the girls bought rings. The boys were such good sports with all of our window and market shopping. But you should have seen the look on their faces when we told them we could just meet them at the beach. They couldn't get out of there fast enough. We reluctantly headed to the airport, sad to leave the beach and warm weather behind. But what is great about traveling on the weekends is that when I go home, I'm still in Ireland. Talk about a win win. But we all certainly miss the sun. I'm headed to London for the weekend! Catch my blog sometime next week!